Bought a 2018 Honda Accord Touring 2.0t on a Thursday night. It had 85 miles on it. 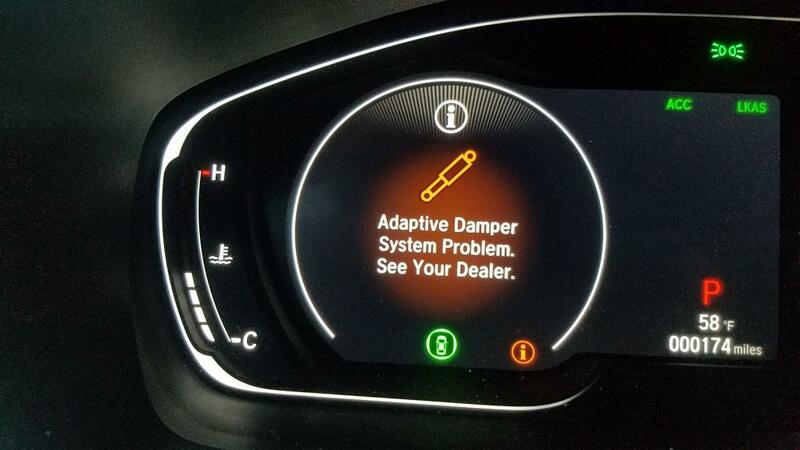 It was a new car and 90 miles later at 174 miles A message appeared and stated Adaptive damper system problem see your dealer. Now I have purchased many autos just in the last year and put much more mileage on all of them without any issues. SO this was extremely annoying seeing that Honda is supposed to be so reliable, I bought a Lexus 200t 2018, Toyota 4runner 2018, Subaru STI 2018 and a Honda CIvic SI. None had any issues after over 10k each. 174 miles and I cannot select between eco and sport this message pops up every time I get in the car. I have yet to solve the problem, I have a scheduled appointment with Honda. I tried to reboot the system by disconnecting the battery and reconnecting but is didn't help. Will report the fix after I get it back from the dealer. Very upsetting thought to have to go in after just driving it for 90 miles.